Registration is now closed. Please contact the organiser with any further enquiries. The global market for large-scale risks has never been more important, as climate change exacerbates natural disasters and concerns arise over new threats such as cyber-risk. Reinsurance is the market that insures insurance companies, enabling them to pay the losses from these devastating risks. It is thus a critical market mechanism, providing a key part of the social and economic safety net for picking up the pieces after disasters. Yet it is also a market undergoing an unprecedented amount of change from new competitors and market convergence. This event will present the findings from a unique and ground-breaking book about the practice of trading risk in the global reinsurance industry. An expert panel will debate the implications for the future of trading in large-scale risk and reflect on the lessons we can learn from other financial markets, such as the banking sector. The discussion will be useful to practitioners and academics alike interested in the social practice of financial markets, risk, insurance, reinsurance, and the technologies associated with trading in risk. Clem Booth, (re)insurance industry veteran, currently Chairman of EulerHermes, formerly executive board of Allianz SE and CEO of Aon Benfield Global Inc. Here is Professor Paula Jarzabkowski on Bloomberg Business in the US, discussing her book, Making a Market for Acts of God, based on research done at Cass with Rebecca Bednarek. The book looks at how natural and man-made disasters cost the reinsurance industry billions of dollars – and how changes to the way it is calculated and traded could have profound and widespread implications. 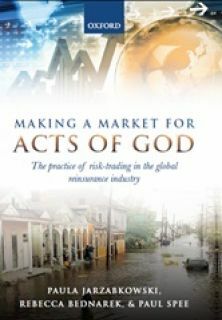 The event will launch our Oxford University Press book: ‘Making a Market for Actors of God: The practice of risk-trading in the global reinsurance industry’.